Altmer are thought to be the most direct, unaltered descendants of the original Aldmer elves, and the transition from one to the other is not very clear. The Altmer seemed to have changed by staying the same. 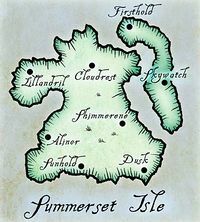 When the Aldmer left their home island of Aldmeris, most if not all of them settled first in the Summerset Isle. Much of their history is lost or hidden, but it is known that many unique ruins and structures, notably the Ceporah Tower, predate the Aldmeri arrival by at least several hundred years. They likely warred with the Sload of Thras and other strange, unknown creatures for control of Summerset in ancient times. At some point they came together and formed the Crystal Tower as a monument to the spirit of their race, and it was the pinnacle of magical learning until the construction of the Arcane University. Social clashes among the Aldmer would lead to a series of emigrations from Summerset Isle to regions all over Tamriel, notably under the prophet Veloth, which would lead to the great diversification of Elven races, such as the Chimer, Bosmer, Orsimer and Ayleids (exactly when and where the Dwemer and Snow Elves emerged is not clear, but they are believed to all have a common ancestry). Many different, often corroborating legends claim that the changes of each race were the result of differences in their worship of deities. While mainland Tamriel experienced many problems and sagas during the First and Second Era, the sea insulated the Altmer of Summerset from their problems, though they had their own limited internal conflicts as well as repeated, large-scale invasions from the Sload and Maormer to deal with. Eventually, the Altmer became tired of living under constant threat and in the Second Era formed the Aldmeri Dominion with the Bosmer of Valenwood. However, they could not stand against the forces of Tiber Septim and the Numidium, which crushed the Dominion and finally brought the Summerset Isle into the Imperial fold in 2E 896. Then, in the War of the Isle of 3E 110, the Maormer were on the brink of finally taking Summerset, and the Altmer had to accept assistance from the Empire to survive. The Altmer remember these incidents with shame and horror, and they have likely contributed to recent social unrest among their youth. At the time the Crystal Tower was built in the Merethic Era, the Elves of Summerset had a relatively egalitarian society, though social stratification slowly developed into a rigid hierarchy of classes over the millennia. The Wise (teachers and priests) became the highest echelon, followed by Artists, Princes, Warriors, Landowners, Merchants, Workers, and enslaved beasts such as goblins. Early literature by man painted the High Elves in poor light, though the impartiality of these accounts is questionable. It was suggested that the Altmer practiced eugenic infanticide, putting to death nine in ten of their newborns due to impurities, that Altmeri names are simply combinations of numbers in their own language, and that Altmer culture revolves around displaying social status. Later writings contain no mention of any of these practices; whether they were fabricated, exaggerated, discontinued, or covered up afterwards is not known. The creation myth of the Altmer begins before the start of the Dawn Era and the beginning of time: the primordial force of Anu, stasis or order, created Anuiel, the soul of all things, so it could know itself. Anuiel in turn created Sithis for the same purpose, who was the force of change and chaos and the sum up of all limitations, and their interrelation created the Aurbis, where the Original Spirits, the Aedra and Daedra, emerged before the creation of the Mundus. The ancient Aldmer believed they are the relatively feeble descendants of the Aedra ("Aedra" roughly translates to "ancestor spirit"), aspects of those Aedra who populated the Mundus so that it might last despite Lorkhan's deception. As their hierarchical society developed, the lower classes stopped worshipping their own "lesser" Aedra in favor of those claimed by their social "betters". Thus the Altmer pantheon slowly formed around the most popular and well-known of the Aedra, which included Auriel, Trinimac, Syrabane, Phynaster, Magnus, and Y'ffre, many of whom would later be incorporated into the Nine Divines. The transition and choices have not gone without detractors. As mentioned, whenever a substantial minority had some sort of socio-political or theological disagreement with the majority in Summerset in the Dawn Era, the dissidents would leave and usually go on to become other races of Mer. However, some time in the Merethic Era, one early group of dissidents who opposed the evolution to the traditional Altmer pantheon left the mainland of Summerset but remained quintessentially Altmer. The Psijics decided to follow the mystical Old Ways of Aldmeris and broke away to settle Artaeum, the third largest island of the Isle, though they apparently managed to stay friendly with their snubbed mainland brethren and it's assumed they use their advanced magic to help protect the Altmer in times of strife. A leader of the Psijics, Rite Master Iachesis, apparently led them throughout the entire First Era (about three thousand years), giving some indication of the potential longevity of the Altmer. In recent times (for an Altmer, the last several hundred years), the younger Altmer have been pushing for social reform, an unusual phenomenon for a people who are used to dissidents simply leaving. But there are few if any places left to go at this point. Some change has already taken place: for the first time ever, the Altmer have started letting other races and cultures come to their shores; some have even been allowed to rise to the ranks of nobility in Summerset. Many young rebellious Altmer have turned to the Psijics for guidance (somewhat ironically consulting their distant past for a path to their future), while some militant radicals have turned to terrorism. 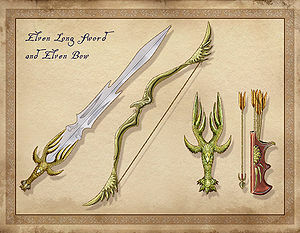 In TES II: Daggerfall, the book The Wild Elves referred to the High Elves as the "Salache". For Altmer names, see here. This page was last modified on 4 January 2019, at 01:28.